More than 20 years after it was introduced in Japan, the PC Engine is still going strong--in the minds of its many fans. Case in point: The inaugural issue of PC Engine Gamer, an online magazine that hit the Interwebs yesterday. 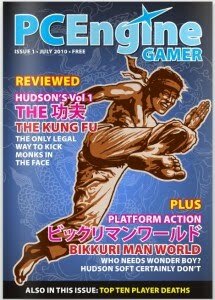 The 18-page publication (check it out here), produced by the folks behind the PC Engine Software Bible site, features reviews of Bikkuriman World and The Kung Fu, a top 10 list, tips and tricks and more. Now when someone does this for the NES, I'll be there.